Laguna Pond Nets have a wide variety of features that make maintenance in and around ponds very convenient. This net has an extendable aluminum shaft that can be adjusted to provide precisely the right length. The shaft extends from 33" to 61". A slip-resistant handle helps ensure a good grip when your hands get wet. The net frame has a plastic guard that protects the net from tearing due to friction. The frame has rounded corners for access to hard-to-reach places. The soft netting is fish friendly. The pond net comes complete with a hanging string for easy storage. 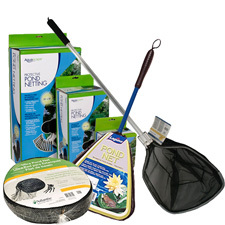 Pondmaster Pond Nets fit all your water gardening needs. They're available in convenient, small stationary sizes or in larger telescoping sizes that reach up to 6-1/2". They are very versatile and can be used for general purposes, surface skimming and fish handling. Telescoping handles extend up to 6-1/2"